In most cases, history judges a Chief Executive Officer’s performance by the financial performance of the company, as well as the performance of the stock. McDonald’s (MCD) current CEO Steve Easterbrook began working there in 1993 as a Financial Reporting Manager in London. In the last 25 years he has worked his way up the corporate ladder, not always with McDonald’s. But after various tenures at other companies, Easterbrook was appointed CEO of McDonald’s in 2015. Since he became CEO, Easterbrook engineered a remarkable turnaround at McDonald’s. He has spearheaded many initiatives that have fueled McDonald’s return to prominence. The fundamentals and share price of McDonald’s have followed suit. Steve Easterbook’s career with McDonald’s was initially focused in Europe. Prior to 2010, he served as President and CEO of McDonald’s UK as well as the President of Europe’s Northern Division. On August 24th, 2010 he was named Global Chief Brand Officer. Later that year, he was promoted to President of McDonald’s Europe. Easterbook briefly left McDonald’s to take the CEO role at PizzaExpress. But his departure from McDonald’s was short-lived; on April 12th, 2013, he was named McDonald’s Global Chief Brand Officer. The value of his work in that role is easy to see. According to Forbes, McDonald’s is the #11 most valuable brand in the world, worth approximately $41.4 billion. Easterbrook would leave McDonald’s again in 2014 to become Senior Executive Vice President of Restaurant Solutions Group. But less than a year later, he was back at McDonald’s. Easterbrook’s leadership of McDonald’s officially began on March 1st, 2015. He succeeded Don Thompson, who stepped down on January 28th 2015, after a relatively unimpressive tenure with the company marked by several years of slowing growth and disappointing performance. After McDonald’s earnings-per-share reached a peak of $5.55 in 2013, profits steadily fell to $4.80 per share in 2015. Easterbrook took immediate action to right the ship, and McDonald’s has enjoyed a resurgence. McDonald’s has gone through multiple changes since Easterbrook took over, including major investments in store renovations, new menu offerings, as well as a massive buildup in technology and digital growth. McDonald’s unveiled popular new menu initiatives such as all-day breakfast and a revamped Dollar Menu. Last year, McDonald’s rolled out McDelivery with UberEats to over 7,800 restaurants, spanning 47 countries across six continents. McDonald’s will continue to accelerate the use of technology to boost sales, such as self-order kiosks and mobile ordering and pay through the McDonald’s app. Mobile order and pay was rolled out to over 20,000 restaurants in 2017. These initiatives are designed to cater to tech-savvy customers while reducing order fulfillment times. Perhaps the biggest driver of McDonald’s earnings growth in Easterbrook’s tenure was the move to franchising. Accelerated franchising reduced McDonald’s total sales, as the company receives a portion of sales, but greatly enhanced profitability. Franchising removes a great deal of operating costs, which significantly increased McDonald’s profit margins. By the end of last year, over 90% of McDonald’s global restaurants were operated by franchisees. Accelerated franchising helped McDonald’s reduce its net general and administrative costs by $500 million through 2018. And, McDonald’s expects to cut another 5% to 10% from its remaining cost base by the end of 2019. Ultimately, the performance of a CEO is aligned with the performance of the underlying business. 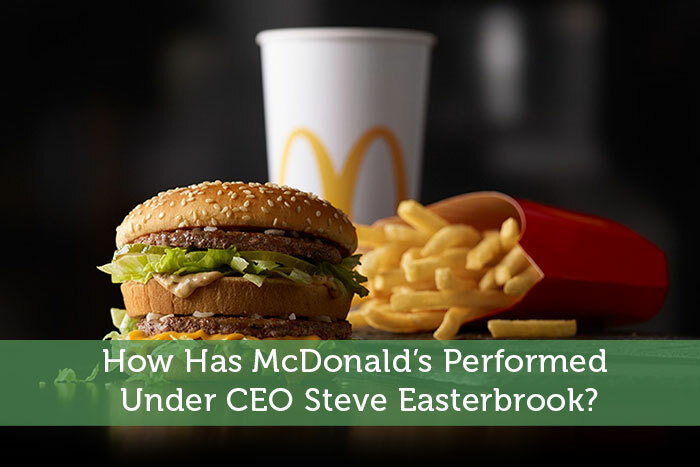 The growth initiatives put in place by Easterbrook had a direct impact on McDonald’s financial performance. The results have been extremely promising. In 2015, McDonald’s earnings-per-share bottomed at $4.80. Last year, earnings-per-share reached $6.37, a 15.2% average annual growth rate since Easterbrook took the helm. As shown in the following image, McDonald’s earnings-per-share have increased right alongside the corresponding increase in franchised restaurants. McDonald’s performance has also improved in recent periods. In the 2018 third quarter, McDonald’s sales of $5.4 billion a 6.6% decline from the same quarter last year. But again, this was due to McDonald’s refranchising strategy. Comparable restaurant sales rose by 4.2%. This reflects sales growth at locations open at least one year, and is a crucial financial metric for a restaurant company. Positive comparable sales growth shows that a company can generate growth not just from opening new locations, but by increasing sales at its existing restaurants as well. McDonald’s earnings-per-share rose to $2.10, a 19% increase versus the prior year’s quarter, mainly attributable to higher franchise fees, lower taxes, and share repurchases. As Easterbrook turned McDonald’s around, investors have generated strong gains along the way. McDonald’s rising earnings growth has allowed the company to return greater amounts of cash to shareholders. McDonald’s has increased its dividend each year since its first dividend payment in 1976. But as the company’s financial performance stagnated during the previous CEO’s tenure, its rate of dividend increases slowed as well. McDonald’s raised its dividend by less than 5% in 2014 and 2015. McDonald’s improvement in the Easterbrook years has directly benefited investors who own the stock primarily for dividends. In 2018, McDonald’s increased its dividend by 14.9%, its highest dividend raise since 2008. The company also dedicated more cash flow for share repurchases, which helped grow earnings. McDonald’s ended 2017 with 794 million shares outstanding, a 12.5% reduction since 2015. McDonald’s stock closed at a price of $100 on March 2nd, 2015. This compares with a closing price of $184.69 on December 10th, 2018, for a gain of 84.7%. Assuming reinvested dividends, McDonald’s shareholders enjoyed total returns of 105% during Easterbrook’s tenure. Considering the S&P 500 Index generated total returns of 34% in the same time, it is clear that Easterbrook had a positive impact on McDonald’s. A company’s CEO has a huge impact on a company. McDonald’s is a case study of how a CEO can have a positive impact. McDonald’s brand strength has been restored under Steve Easterbrook’s leadership. Earnings-per-share and dividend growth have accelerated as well. And, the future is bright. McDonald’s should continue to reap growth from strategic initiative such as new technologies, along with expansion in new markets. How Has McDonald’s Performed Under CEO Steve Easterbrook?